The holes in the benchtop are drilled to take dogs for gripping workpieces. Don&#39;t be sparing with these! A couple of coats of finishing oil and the bench is complete! 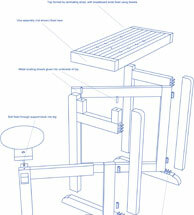 The brief for this project was to produce a bench that would be useful in a very small workshop. 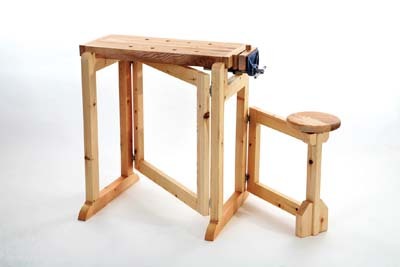 Thinking about it, I was inspired by a carvers' bench, and thought that an adaptation of this design would be of use to both general woodworkers with a very small workshop, and any woodcarvers with similar space constraints. I was using up some standard 3 x 2 PAR softwood, and a couple of rather tatty boards of 1 1/12in ash. 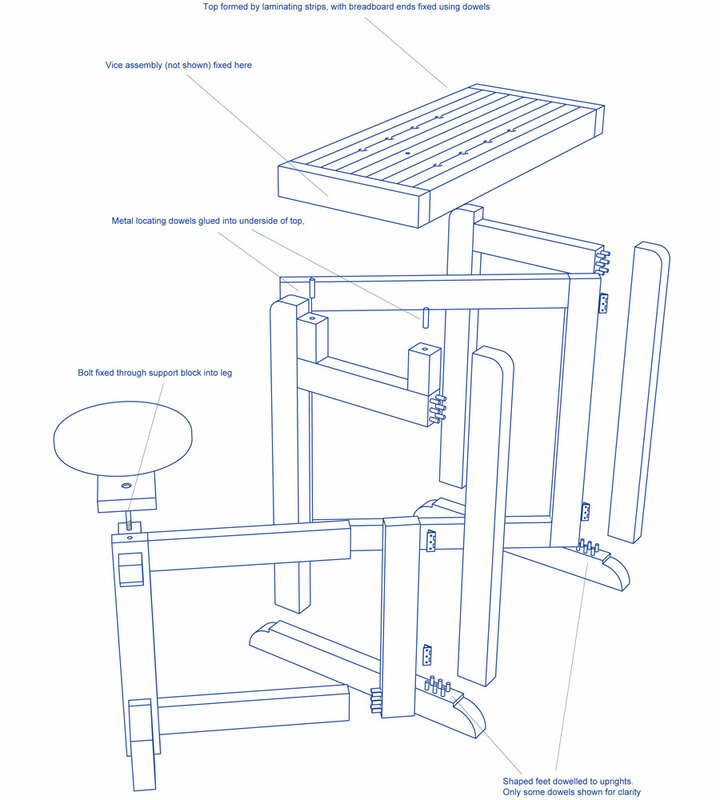 to get the relative height of the seat and bench just right for you. I spent some time playing around with a small stool and a desk on blocks of wood to be sure the finished heights were suitable. 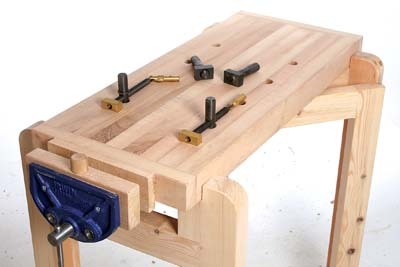 I fitted a conventional woodworking vice, to which I added a front dog, along with a series of holes in the benchtop for both fixed and screw adjusting bench dogs. 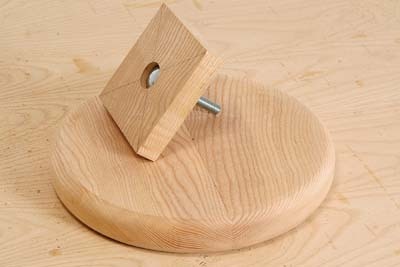 I also made provision for the quick fixing of a heavy-duty pivoting vice for anyone who wanted to use the bench for carving in the round. 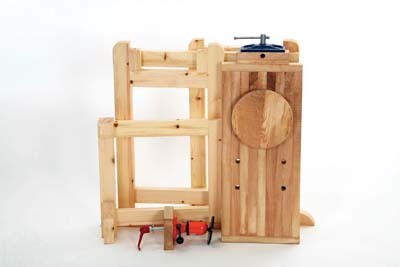 Construction is very simple - I just used dowels, but the alternatives are mortise and tenon joints, Dominos, or biscuits. 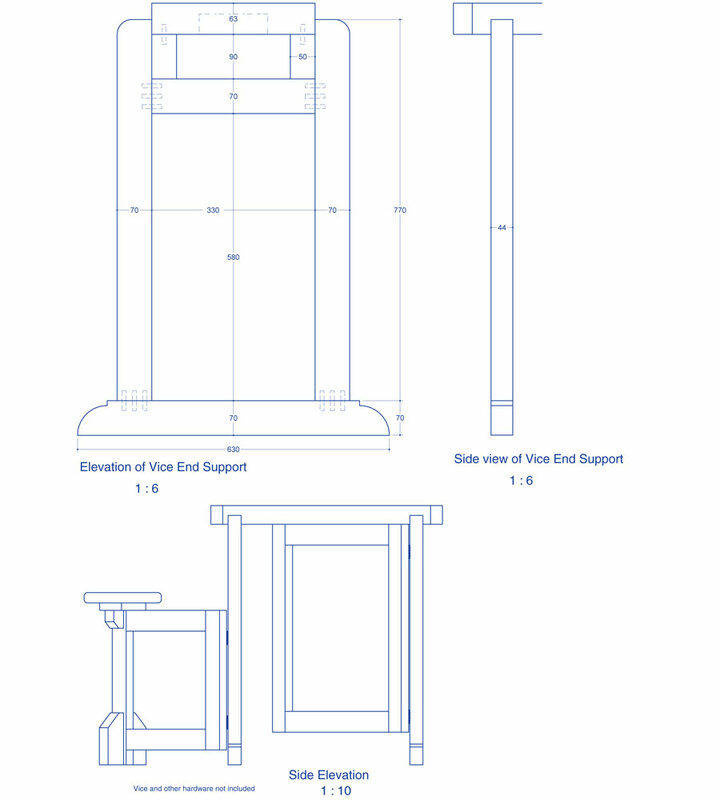 I always feel that the strength of modern adhesives makes heavy structural joints like the mortise and tenon less necessary these days, but the choice is of course yours. 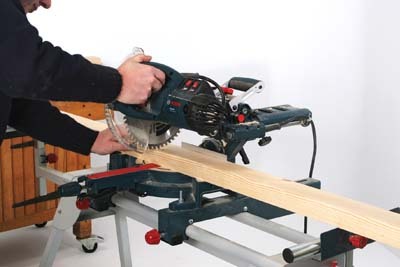 The first stage is to cut out the longest lengths of frame material and here a chop saw with outrigger supports is a real advantage, but make a trial cut first to check that the saw is actually cutting spot-on, or the frame will not end up flat or square. 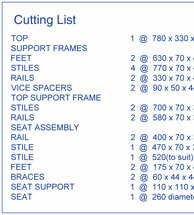 Each component can be cut to exact size when you are dowelling - there is no need to allow anything for the joint. 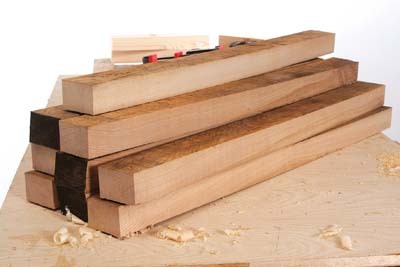 Lay out each frame on the bench and clearly mark a face side and face edge to ensure proper dowel orientation later. The top and bottom rail ends are marked out with a simple curve - I have cut out a series of aluminium circular templates just for this purpose. 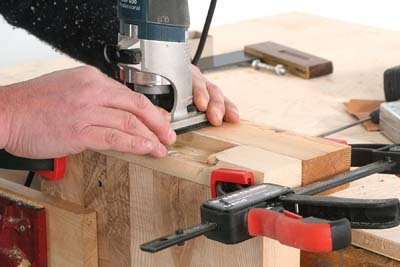 Cut the shape carefully using a jigsaw - a sharp clean-cut blade and steady feed pressure should ensure that the cut stays true and does not end up angled. 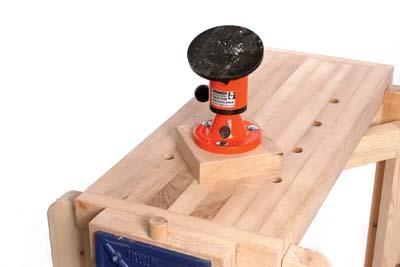 Cut just clear of the line and then sand back to a smooth curve using a bench mounted disc sander, but once again, check that the table is perfectly square to the disc. 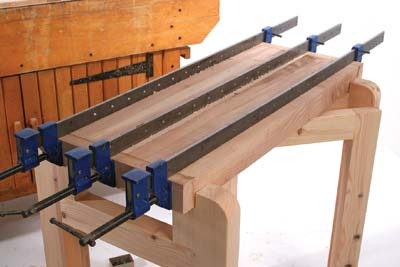 For the dowelling I use a Joint Genie jig - in fact two jigs bolted together to give me the double row of holes. 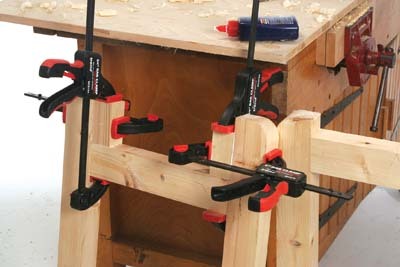 The jig is clamped in place with a couple of F-clamps. As it will not necessarily centre perfectly, it is essential that you work from the face side and edge on each piece to ensure the mating halves align perfectly. 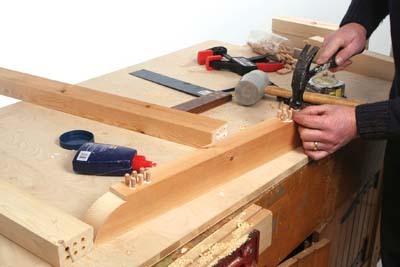 I use six 8mm dowels for each joint, setting the depth stop carefully with just a fraction of clearance so the dowels wouldn't bottom before the joint was firmly closed. You can't use the end stop on the jig for the joints in the base rail, so set this out manually with some careful measuring. 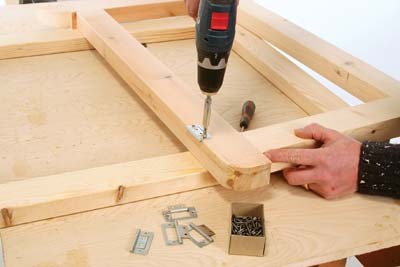 Assemble each frame, ensuring the dowels are well covered with glue. 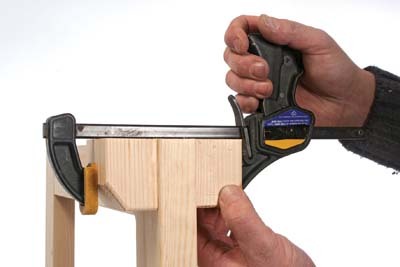 Clamp up carefully making sure the frame remains square - it is so easy to pull it out of line if the clamps are even slightly angled, so keep checking and don't overdo the pressure. 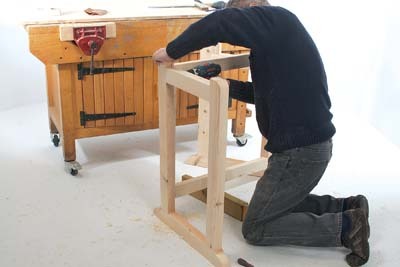 The frame for the central support and the swing out seat are made in exactly the same way, but this time just using three dowels per joint as the material is thinner. 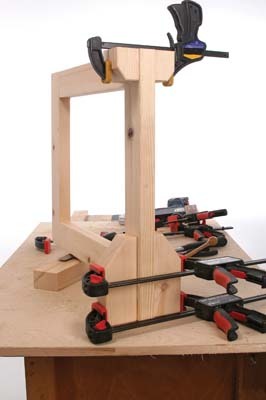 The top cross rail on one of the frames is set down lower to accommodate the vice, but then glue in a couple of riser blocks to support the top at the same height as the other frame. 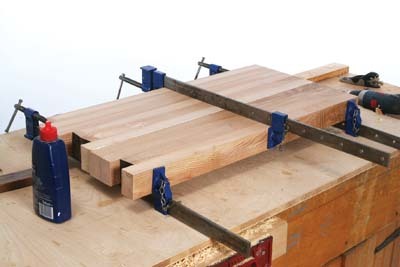 Follow our Top Tip (see opposite) and when you apply clamps, any glued blocks will not slide. 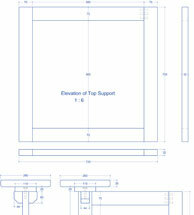 Repeat the same procedure for the lower support blocks. 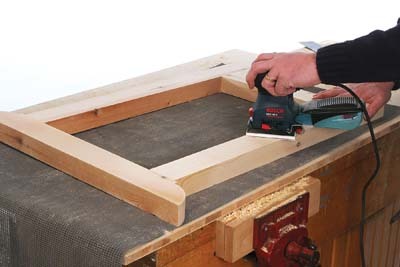 Once the frames are thoroughly dry, clean them up and remove any pencil marks using a sander. I prefer the controllability of a small palm sander for narrow section material. To minimise the possibility of splintering or otherwise damaging the edge on benches like this, which are bound to get a bit knocked about, I always radius over all the framework edges using a tiny bearing guided router bit. For this type of work, I feel that the tiny rounded edge gives the finished frames a much more professional look, but don't overdo the size of the radius. The top is made from some kiln dried ash. 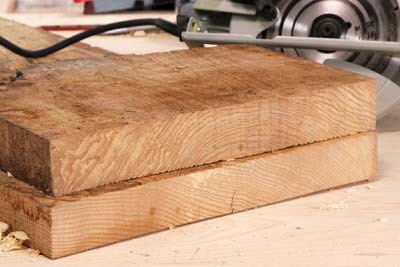 I am always worried about the stability of this type of material in wide pieces, particularly when it is a long way off being quarter sawn, like these two boards. 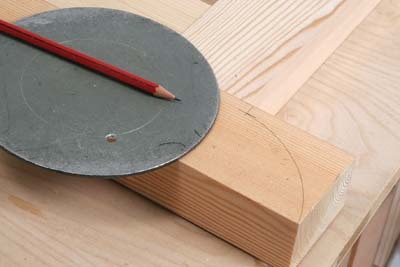 To overcome this stability problem, and also to produce a thicker top, rip it up on the bandsaw into 64mm wide strips. Plane and thickness these all round and then glue them together on edge to produce a thick top - the grain orientation now makes the potential for movement far less. Breadboard ends complete the top and these are just dowelled in place. 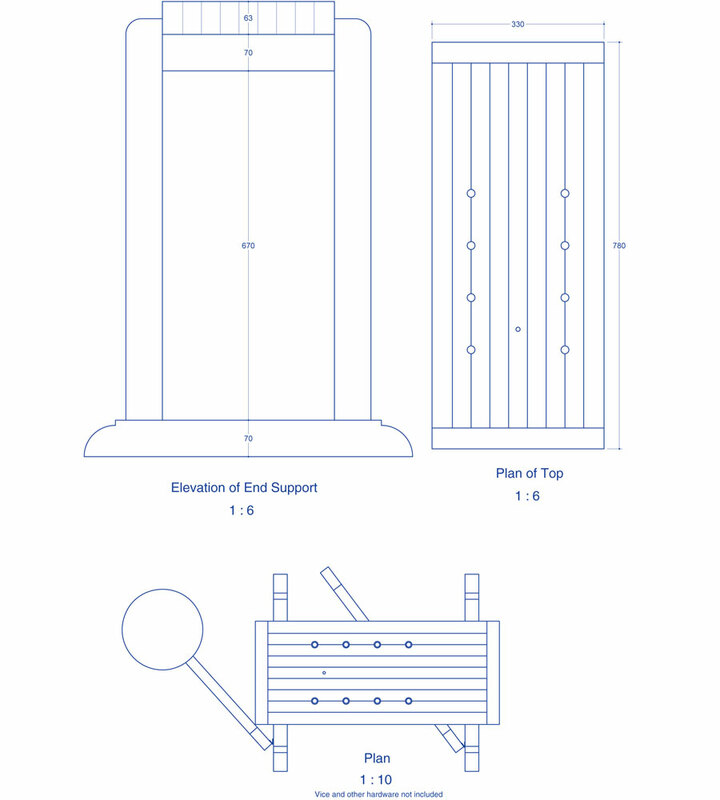 Normally this would not be recommended practice as a conventional top would move much more relative to the ends, but a laminated construction like this will minimise any problems with later movement. Once dry and cleaned up, the top can be drilled to take dogs which will suit whatever holding arrangements would want to fit. Don't be too sparing with the holes - the more you have the easier it will be to accommodate a variety of different workpiece sizes. 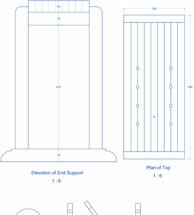 For the sake of neatness and also to make it easier to drop in the dogs, run a tiny chamfer round the top of each hole. 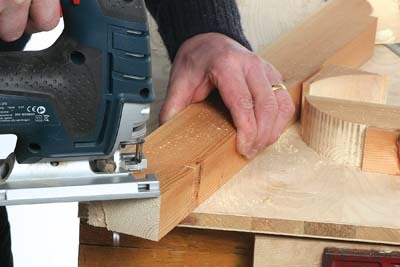 It is probably best to avoid your glue line when drilling just to be on the safe side, so as not to introduce unnecessary weakness. 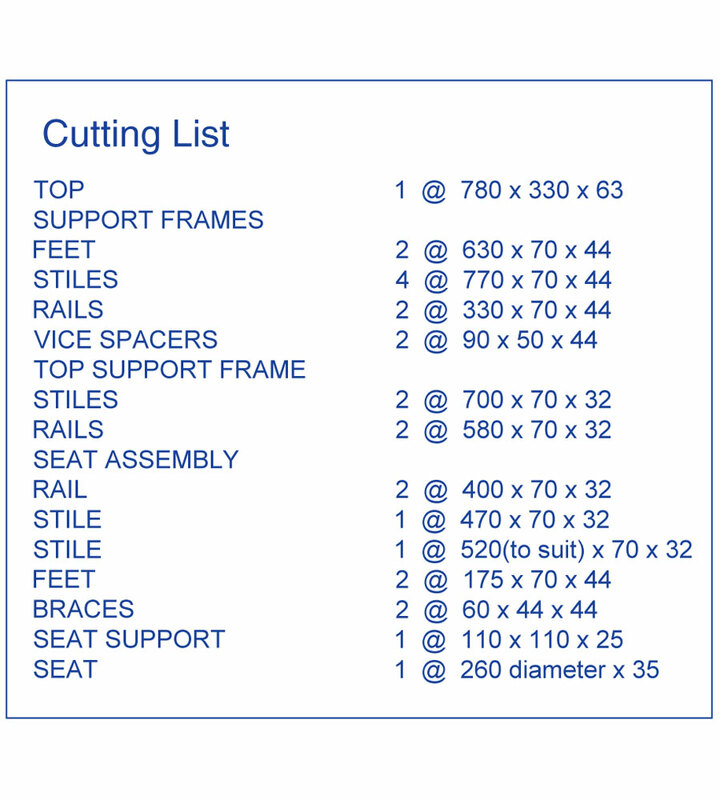 For the seat, I laminated up a couple of offcuts of the top material and cut out the circle with a jigsaw. 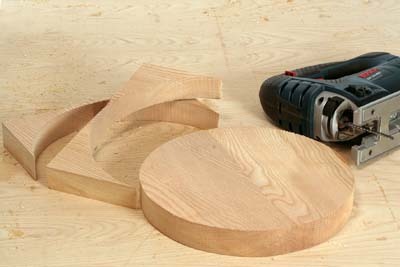 To trim it perfectly circular, use a trammel bar on the router with a straight cutter, taking two or three passes to achieve the full depth. Use double sided tape to stick the top to a piece of sacrificial MDF. 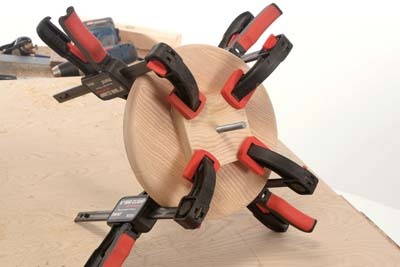 The top and bottom edges of the seat can then be radiused on the router. It locates in the leg frame with a long bolt which is held captive by recessing the head into a small square of offcut material. This square is then glued into place on the underside of the seat. 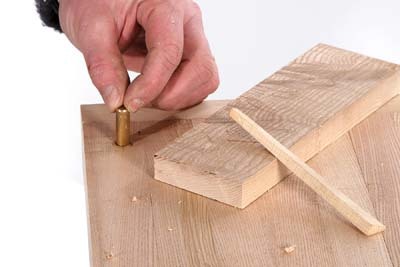 I did consider screwing it as well, but I'm convinced the glue joint will be strong enough on its own. 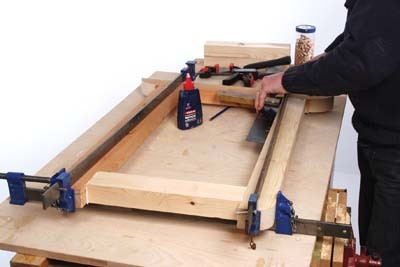 Fit as many of the hinges as possible on the bench as it is so much easier working with the frames flat. 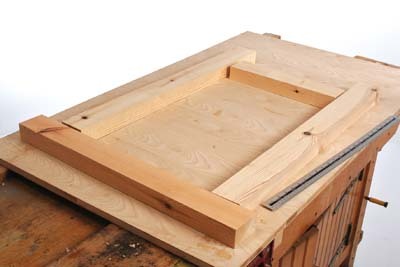 I use simple lay-on hinges which do not require recessing in. 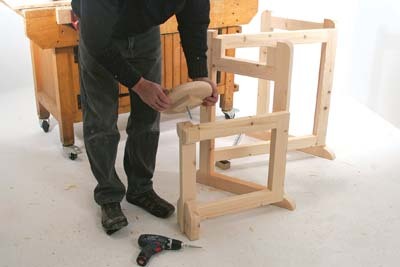 Use props on the floor to hold the central and the leg frames in position while you attach the other leaf of each hinge. 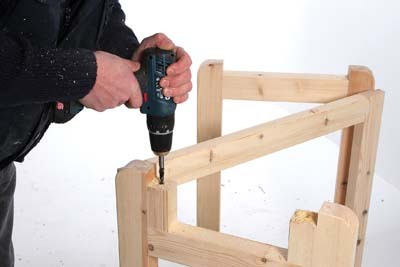 Drill a hole in the leg of the swing out frame to take the seat bolt. I did think afterwards that recessing a nut into the top of this hole would allow you to raise and lower the seat by simply winding it up and down, but in this case, a bigger bolt would have been preferable. 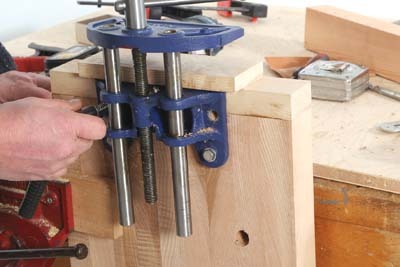 To fit the vice, you need to rout out a recess in the end of the top to take the back flange. 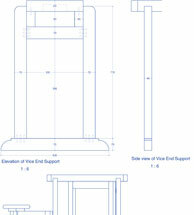 I held the top upright in the vice and clamped on a piece of scrap to provide more support for the router base. Fine tune the fit until a flange fits flush with the end of the top - you may need to taper the recess slightly to accommodate the thicker web at the bottom of the flange. Before fitting it in place, attach the inside wooden jaw plate by screwing through the back of the flange. 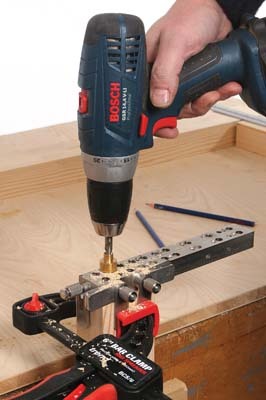 The vice can then be firmly fixed to the top using 50mm coach screws, drilling the appropriate pilot holes first to maximise the grip. 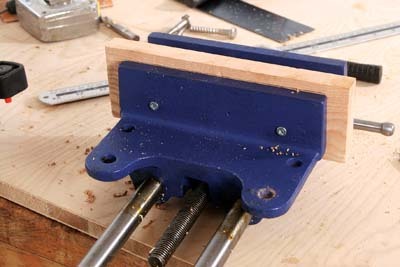 Now, tighten up the vice to hold the front wooden jaw plate in position, and screw through the two front holes. 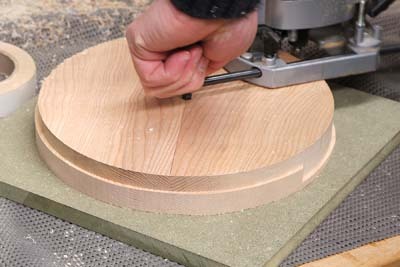 Use a finely set plane to trim the plates to be flush with the benchtop. For the front vice dog, I drilled a hole in the jaw plate and then turned a small dog, though as the hole is the same size as the bench top holes, any of the other metal dogs can be used. 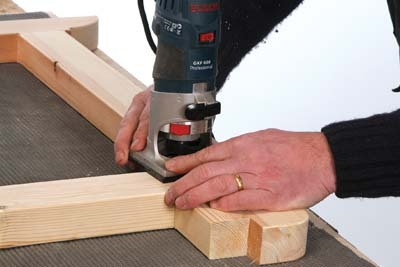 To hold the top in place, drill a 10mm hole on either side of each end frame. 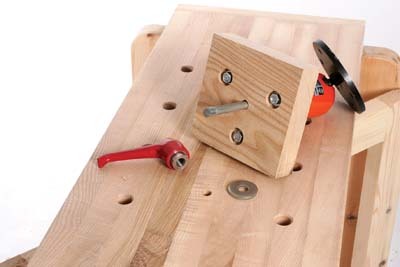 Then temporarily insert a dowel marker in each hole and drop the top down onto them. 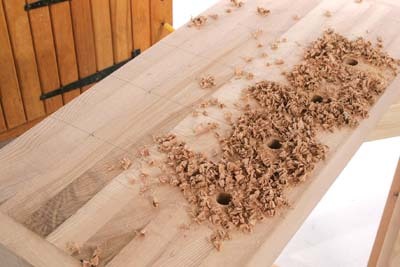 This should leave a clear mark for the matching holes in the top which can then be drilled with the same drill. The locating pins are short lengths of 10mm brass bar epoxied into the top. 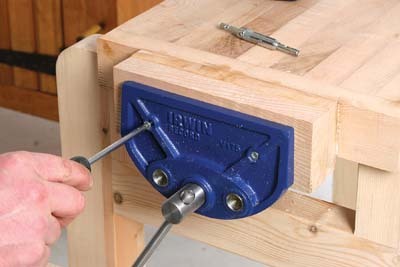 The pivot vice is held similarly to the seat top, with a captive bolt countersunk into a mounting block, with a large washer and locking handle to secure it to the bench. I actually drilled a dedicated 10mm hole just for this vice, though there is nothing to stop you using the bigger dog holes if need be. 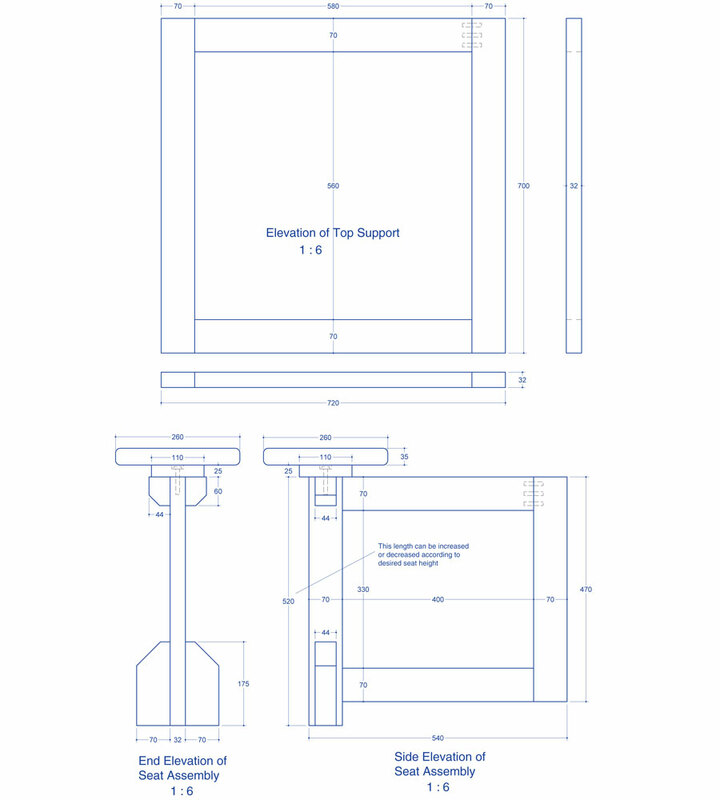 The swing out frame also needs some extra support blocks top and bottom, which again are simply glued in place. 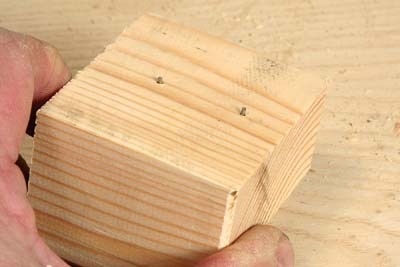 However, it is often very difficult to stop these blocks sliding as you clamp up, so knock in a couple of very fine panel pins. Then use some pincers to snip off the heads, leaving just a couple of millimetres of the pin proud of the surface.